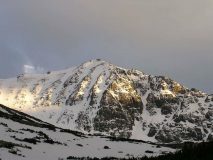 In Eastern Rila, near the popular resort called Borovets,soars the highest peak in Bulgaria — Musala. At a height of 2,925 m, Musala is not only the highest peak in Bulgaria but also on the Balkans, higher even than Mytikas peak(1,917 m), which rises on the mythical Olympus. No matter whether you have already ascended Musala or you are planning to do it soon, there is always something worthwhile to learn about this majestic peak which today we all call by the name of Musala. Did you know, for example, that the biggest debates among experts for a number of years concern the origin of its name? According to one of the experts, the name Musala is of Arabic origin and means “close to God” and, according to others, “Musalat” means “dominating”. Who is right and who is wrong, we cannot say for sure, but the fact is that Mount Musala is the most magnificent and highest peak on the Balkans… and that is enough for us. The best time to go to Mount Musala is late spring or hot summer (especially if you are not very experienced mountaineers). Even in the summer, however, if you go up to the top, you must ensure to have the appropriate equipment which includes, in addition to comfortable shoes, a raincoat and overcoat (mandatory). We mention it because, even in the hottest month of August, Musala’s temperatures rarely exceed +5 degrees which is quite cold. The snow cover at the top lasts for up to 8 months, and its thickness may exceed one meter. That’s why, even if you feel warm at the foot, put a thick overcoat in your backpack in order to be prepared for any surprises along the way. The routes to conquer Mount Musalaare many but we’ll just take a look at some of the most popular ones and we’ll just mention the rest in briefly. This is the easiest and safest route to the top but it is good to know that this is the most preferred route of the tourists and it is nice to set up your mind in advance that you will be going to the top with many other enthusiasts who also try to conquer Musala in the summer. The crowd can be a bit tedious but if you are not sure about your preparation, it is better to choose this route. The route starts from Borovets from where you have to get on the lift to the Yastrebets mountain-hostel. Traveling by lift is pleasant and you can enjoy the beautiful views; it will take only 30 minutes and will save you about 5 hours of walking. From the Yastrebets mountain hostel start the pedestrian stages, the first one is from the Yastrebets mountain hostel to the Musala mountain hostel. The way up there is straight and comfortable and walking will not be difficult for you at all. The distance from the Yastrebets mountain hostel to the Musala mountain hostel is about 3 km, the displacement is +20 m, and the time for which you will reach from one mountain hostel to the other will be no more than an hour. When you reach the Musala mountain hostel you can relax for a while, breathe in fresh mountain air, eat and gather your strength. (Near the hostel there is a beautiful lake which you can admire). The next stage of the route is from the Musala mountain hostel to Ledenoto Lake shelter. At this stage, a little more difficulty is expected, as the displacement is bigger (+320 m) and there are a lot of sections with big stones on the road that can make it a bit difficult and slow you down. 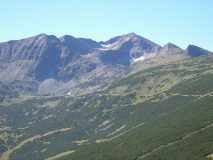 The distance from the hut to LedenotoLakeis just over 2 km which at an average climbing rate can be reached for about an hour– hour and a half. If you reach the shelter, give yourself at least 10 to 15 minutes of rest because you will need a lot of effort for the next stage. We mention this because the last stage is the shortest, but it is also the most difficult to cover because it is very displaced (+216 m) and the trail is narrow and rocky. The distance from the shelter to the Musala peak is less than a kilometer and it will take you about 30 minutes to congratulate yourself on conquering the highest peak in Bulgaria and on the Balkans. This route is completely secure, has very good markings and is easy to complete even if you have small children. Climbing time – 3 hours. Remember, Mousala is on the list of the 100 national sites, and if you have a booklet, carry it with you to put your stamp at the weather station on the top. You can cover the classic route also on foot (without taking the lift), then from Borovets you have to go on a dirt road to the Musala mountain hosteland then to the Ledenoto Lake shelter– Musala peak. Climbing time without a lift – 6–7 hours. This is the most popular route to Musala from its southern side, and is the most preferred route if you will conquer the peak of Bansko. If you are on vacation in Bansko and you have decided to make the trip, you have to get to Yakoruda, Belmeken or Ribni Lakes(as it is most comfortable for you) and from here on well-marked trails get to the Granchar mountain hostel. 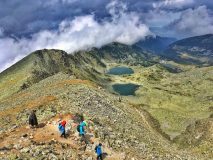 This route is also completely safe, you will enjoy beautiful views, you will pass along some of the most beautiful peaks in Rila(Marishki chal, Yurushki chal, Big and Little Twin). The final stage of climbing can be a bit difficult for you as the displacement is quite big but the efforts are completely worthwhile. The time that it will take you to cover this route is about 5 hours. Another very nice route to Musala on its southern side. In the first stages the transition is very pleasant and light, and the path is almost without displacement. The route passes through the valley of the Maritsa River, climbs near the Marishka lakes, passes through some of the most beautiful peaks of Rila and the Marichinite Lakes. The last stage of the lakes to the top is a bit more difficult because of the large displacement. Climbing time – 4 hours. This route is a bit more difficult, and if you are not well prepared, it’s better to skip it. The transition starts from Borovets to the Zavarchitsa mountain hut and passes through Marishki chal. The route goes through stones and a bigger displacement and takes just over 5 hours. on the ridge of the Musalenski venets. These are the summer routes but there are also winter ones that you can go if you wish. It is good to know how prepared you are before going on the winter routs as even in summer they are far more dangerous. If you plan to make a winter pass to the top, then you must obligatory have a guide and have very good preparation and equipment. At the top is the highest weather station in Southeastern Europe. The station is also one of the oldest weather stations in Europe. The weather station was built in 1923 on the personal orders of Tsar Boris III. At the beginning of the last century it turned out that there is no station on the Balkan Peninsula to do meteorological research. That is why tsar Boris III ordered the building of an Observatory on the highest peak. After putting it into operation, the data collected by the station was transmitted on the tsar’s personal telephone line. Rila is at the forefront of the Balkans and sixth in Europe after the Caucasus mountains(Elbrus peak – 5,642 m), the Alps(Mont Blanc – 4,807 m), Sierra Nevada(Moulasen peak – 3,482 m), Etna(3,340 m.), Pyrinees(peak of Aneto – 3,404 m). Rila is called the “water mountain’ because there are over 200 lakes on its territory, and not only numerous mineral springs, but also three of our largest rivers: Mesta, Maritsa and Iskar. The highest lake in Rila is the Ledenoto Lake. It is located 2,709 meters above sea level. According to the legend, in clear weather, you can see Aegean Seafrom Musala. The truth is that this is impossible because the mountains in the country and in Greece obstruct the direct visibility, and the very shape of the planet makes it impossible to see such distant objects. But the legend is very beautiful and if you wish so, nobody can stop you from believing in it.